Around Bleacher Report HQ, a lot of meetings end with us agreeing that “it needs to be done by football season.” Football season looms large in our imaginations, sort of like Christmas looms in the minds of 5-year-olds. Today, we’re launching the first of a few of these football season-oriented projects, a redesign to the look and feel of Bleacher Report. It’s subtle, but we think the site looks more contemporary and easier to read and browse. 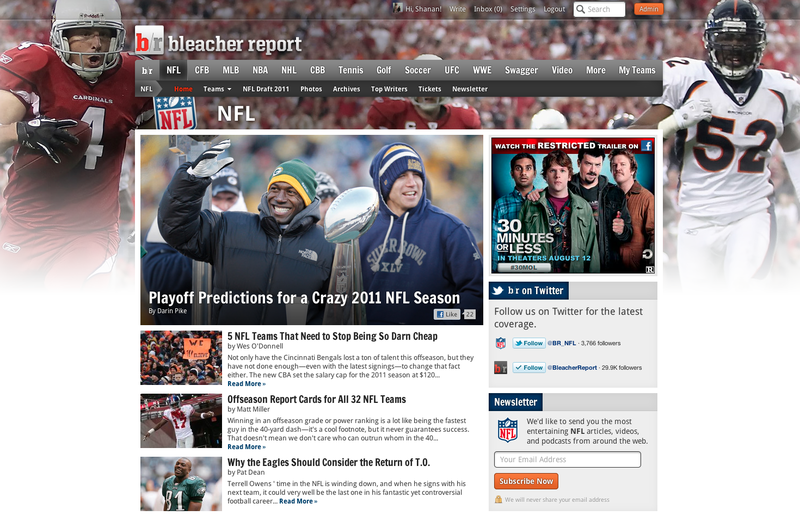 And we think it does a better job expressing some of the personality and fun of Bleacher Report. Give it a look around and let us know what you think. A cleaner design, with sharper fonts. We worked to make the site easier to navigate for folks on tablets. There’s more to come on this, so stay tuned. There’s a lot more that we’re working on, so look to see more improvements to the site in the next few weeks as we move toward football kickoff. Looks awesome guys! Love the sharp new font—makes the writing look less like a school paper and more like a sports-article! Great new look. Love the layout, the background, the font, everything! It looks 10 times better!!! Really amazing job by the design team. Perfect choice for the main font. It’s so much more crisp. The new format does not allow for tables in articles. I just saw one and it is a mess. Definitely a kink that needs fixing. Brandon, can you send me an example? Your page looks good! The new font and the white borders [as you scroll down] add straightforwardness and clearness to the website’s over all appearance. I like it. I like it. I was having a problem before that I couldn’t read article while I was logged in. As a writer on BR, you can imagine that that was a problem. But now it’s fixed! Good job. Put the Top Writers back on the home page for each team and sport! I hate going to the Top Writers tab at the top because those rankings are always old and I have no idea where I rank. Either get your act together with updating the rankings (on Arsenal they’re a day old!) or put Top Writers back on team and league home pages. I want to echo Charlie’s statement – I loved coming to site to see who the most active writers were for each team. I would use that to go look at all of the articles. Not having it on the team home page is not good. I think it looks terrific…especially like the drop cap at the beginning of each story. Great work! How about highlighting which users are making the most COMMENTS in each section? This would be a way for our readers (specifically “active” members) to get some props, too. I don’t know if this is something we want to do or not, but I think it could help generate more comments on our articles if people are seeing their picture on their favorite team/sport’s page.